08/06/2013 • 7:32 am Comments Off on Myth or reality? We all have heard it many times: 80% of black South Africans consult a sangoma before they even consider going to a Western Clinic. I always wondered about it, having worked with sangomas and being involved with the work HOPE Cape Town has done and is still doing in parts with traditional leaders. 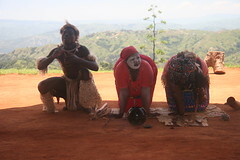 What I have seen is little work for sangomas, lots of part-time traditional healers and a break down in related traditions in the townships of Cape Town. Well, a 2012 article in the South African Medical Journal went further, suggesting that “some 80% of South Africans use traditional medicine to meet their primary healthcare needs”. The claim has also been made in general terms about the population of Southern Africa and the African continent. So where did the claim originate and is there any truth to it? GroundUp, a South African community journalism project, asked Africa Check to investigate. Their starting point was the World Health Organisation (WHO). A fact sheet on traditional medicine published by the body in 2008 is often cited when the claim is made. “In some Asian and African countries,” it states, “80% of the population depend on traditional medicine for primary health care.” The fact sheet does not include any evidence to substantiate the statement, but one can find a reference to a document discussing the WHO’s Traditional Medicine Strategy 2002-2005. And this was not the end of the research – to read more about Africa Check’s research and its amazing result follow this link. In recent years, in developing countries, adults infected with HIV have had greater access to treatment. But UNAIDS says children still lag behind in accessing antiretroviral drugs, especially those formulated just for children. It warns that most who go untreated will die by their fifth birthday. The Elizabeth Glaser Pediatric AIDS Foundation says progress is being made in preventing new infections in children. It says there’s been a 24 percent reduction in new infections since 2009. Much of that is due to providing antiretrovirals to more HIV positive pregnant women. Nevertheless, there’s much more to be done. 09/25/2012 • 9:21 am Comments Off on Only Southern Africa? There is a perception that Southern Africa is the only hot spot of the HIV/AIDS pandemic. But Eastern Europe and Central Asia have the world’s fastest-growing HIV epidemic according to the World Health Organization. It is said the epidemic there is concentrated mostly among injection drug users. Experts blame punitive drug policies, discrimination and trouble accessing treatment. They say the situation will not be contained until local governments affected by the epidemic change their AIDS policies. To read more click here.